Aqui fica a foto da resposta à adivinha Nr. 4. Eram flores de Coraleira (Erythrina crista-galli), aqui com as flores abertas. É já a segunda floração deste ano mas infelizmente o sol forte estraga as flores num instante. Here’s the picture of the answer of Quiz Nr.4. 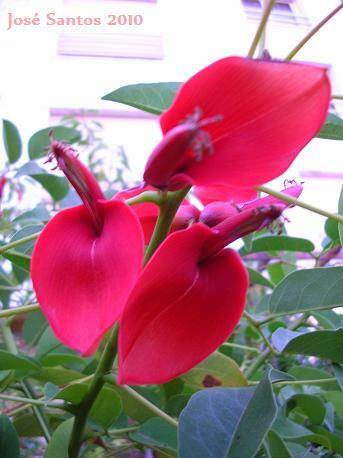 They were flowers of Erythrina crista-galli, the Coral Tree. In the picture in full bloom. This is the 2nd bloom of this year but unfortunatly they don’t last much due the strong sun of the portuguese Summer. Beautiful – love the soft, but rich red colour of these blooms.